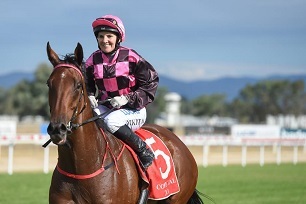 Albury Cup winning jockey Nikita Beriman’s decision to stick with last start winner What A Hoot is a strong push towards the gelding’s prospects at Albury on today. What A Hoot, a well named New Zealand purchase from the mare Hoot ‘N’ Holler, is one of three runners at Albury for Mornington trainer Mitch Beer. The 29-year-old trainer hopes What A Hoot can keep his winning record in NSW intact after winning at Deniliquin on Anzac Day. What A Hoot, who will break through $100,000 in earnings if he is successful in the Benchmark 65 (1000m), is his trainer’s best chance on the seven-race program. What A Hoot was successful at Geelong on April 17 at odds of $31 and before that won at Kyneton at $3.60. Beriman, who won the Albury Cup in March, will stick with the eight-year-old and also ride stable mates Going In Style and Royal Parade for Beer. Nikita Beriman won the Albury Gold Cup in March and returns to the track today. Credit: Border Mail. The young trainer said the four-hour trip to Albury was well worth it with such attractive prize money and a firmer surface to race on than what he could expect closer to home. “Nikita has a strong affiliation with the horse and she was keen to stick with him,” he said. “He doesn’t really handle soft tracks and the weather forecast looked much better at Albury so it is worth coming up. Beer has trained What A Hoot in his own right for his past five starts which have produced two wins and as many thirds. He was purchased as a tried horse after previously being prepared in the city with the Mornington environment seemingly helping the veteran find a new lease on life, according to his trainer. “He is a big grey who the owners bought as a tried horse. If he didn’t make it as a racehorse he was going to be a show jumper so he has done his part this campaign,” he said. “It’s hard to fault a horse who has hardly been out of the prize money in his five starts with me. Beer, whose sister Ash was a former jockey in Albury, also likes the chances of Royal Parade after a last start second at Kilmore. “She has drawn awkwardly, but she has a good amount of speed to overcome it,” he suggested. View the fields and form for today's Albury meeting here.